Revenue, 1862, First Issue, 70¢ Foreign Exchange, imperf (Scott R65a), light handstamped cancel (“Hall & Co.”? ), large margins and unusually bright color; very faint pressed crease, Very Fine appearance. Scott $725. Estimate value $200 – 300. 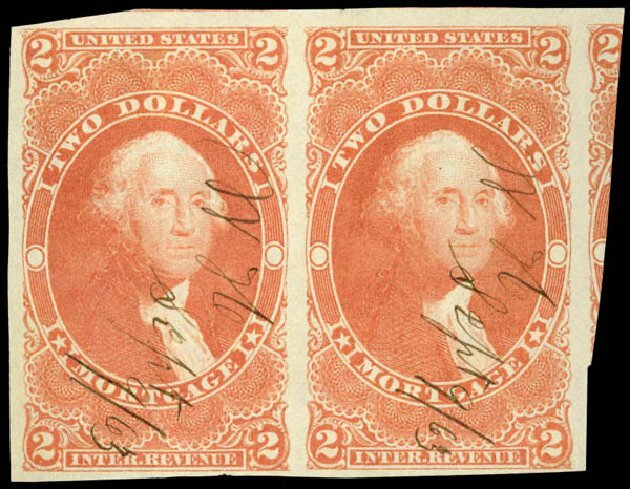 Revenue, 1862, First Issue, 70¢ Foreign Exchange, imperf (Scott R65a), light red circular hand stamp cancel, large to very large margins, fresh and eye catching stamp, Extremely Fine. Scott $725. Revenue, 1862, First Issue, 70¢ Foreign Exchange, imperf (Scott R65a), neat hand stamp cancel, ample to large margins; small tear at upper right and small corner crease at left right, otherwise Fine, 2005 PSE certificate. Scott $725. Estimate $250 – 350. Scott #R65b, 70c Foreign Exchange, part perforate, imperforate horizontally, unusually choice used single, featuring near perfect centering within large margins, prooflike color and impression, lightly cancelled with a central “Phillip Speyer & Co./Jun 30 1963” black c.d.s. handstamp with the appropriate early date for the part perforate variety, extremely fine; seldom seen this nice; 2013 PF certificate..
o Revenue, 1862-71 First Issue, 70¢ Foreign Exchange, imperf (R65a), exceptionally bright and fresh with large margins and a neat manuscript cancel, Extremely Fine and choice. Scott $600 Expertization: 2009 PF Certificate graded XF 90.